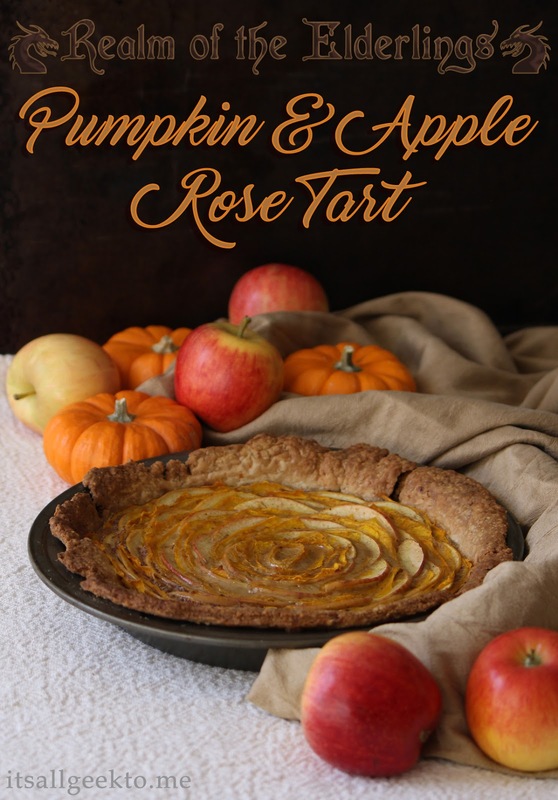 Makes 1 tart: 8-10 servings. 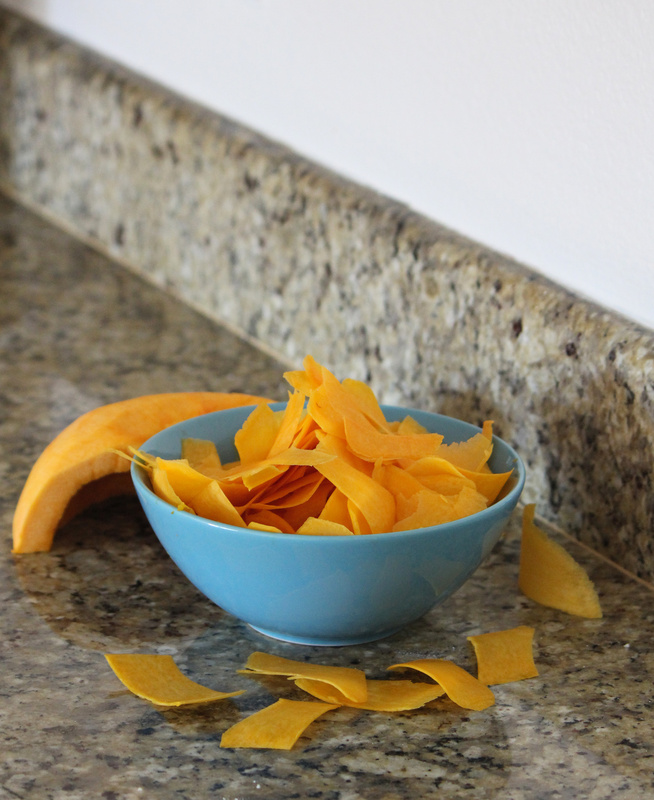 Prepare apple slices: Wash the apples, but leave the peel on for the color contrast. If you have an apple corer, core the apples, then slice each in half along the core. Otherwise, slice each apple in half along the stem, then use a paring knife to cut a V shape into each half to remove the core. With the cut side down, slice the apple into very thin slices, cutting perpendicular to the core. Because the center of these slices is cut out, they bend easily to fit the curve of the pastry shell. Prepare cream filling: Beat together the cream, eggs, sugar, spices and salt until thoroughly combined. 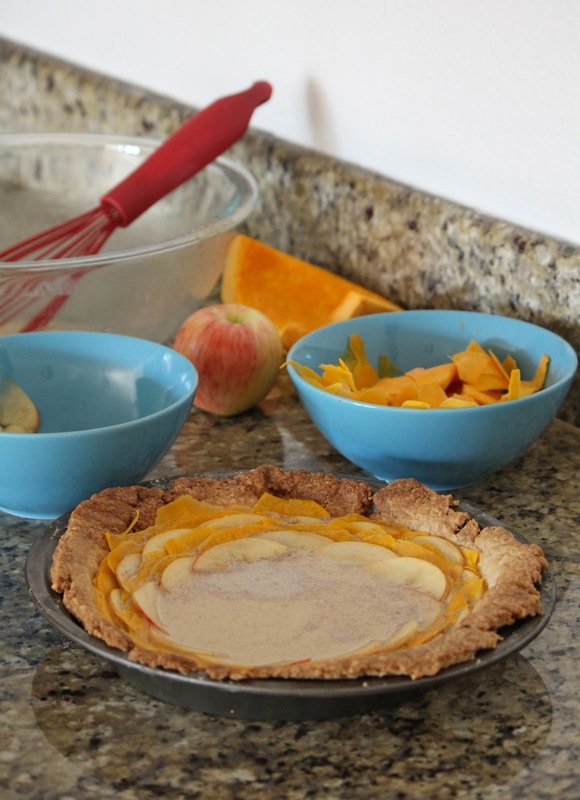 Pour into the pie crust; make sure the crust isn't hot enough to cook the eggs prematurely. Preheat the oven to 350°F, if it isn't still at temperature. 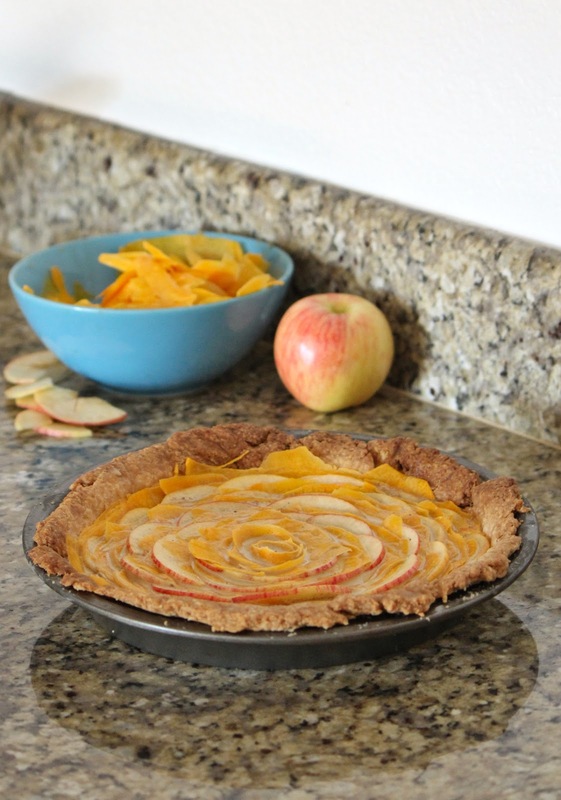 Arrange the pumpkin and apple slices: Line the edge of the crust with pumpkin slices. Have each slice overlap by about a half-inch. The filling should be enough to keep the pieces sticking together. 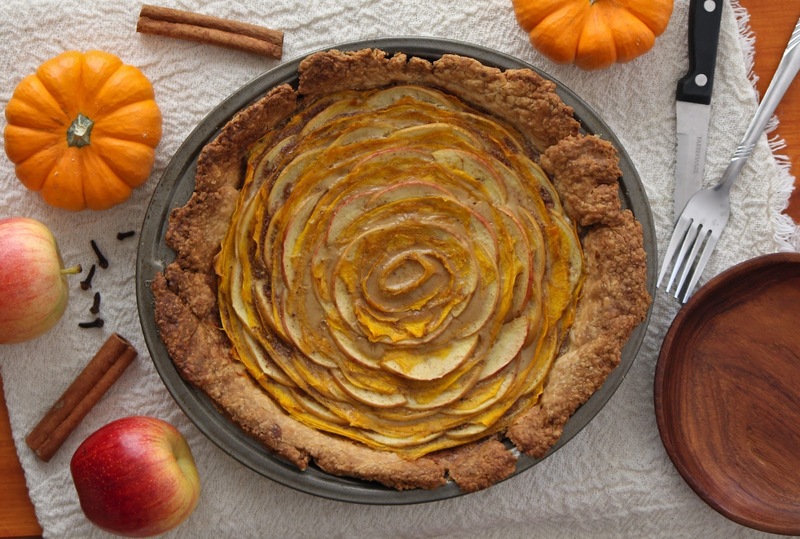 Continue working around in a spiral until you have three layers of pumpkin, then add a layer of apple slices. 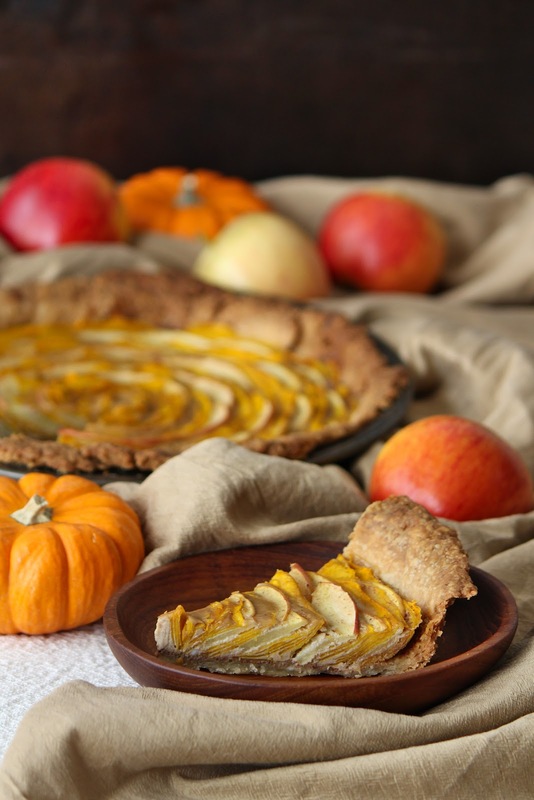 Use your fingers to gently pull in all the slices towards the crust, to pack the pumpkin and apple as tightly as possible and to keep the slices in a nearly-vertical arrangement. (See photo above.) Continuing alternating with three layers of pumpkin and one layer of apple. When you get so close to the center that you can no longer easily curl the fruit slices, wrap a few layers of slices around a finger, then place in the center of the tart and allow it to unfurl slightly. Bake for 30 minutes, or until the filling has set and the pumpkin is tender when pricked. Let cool slightly before serving. This tart is also delicious chilled. 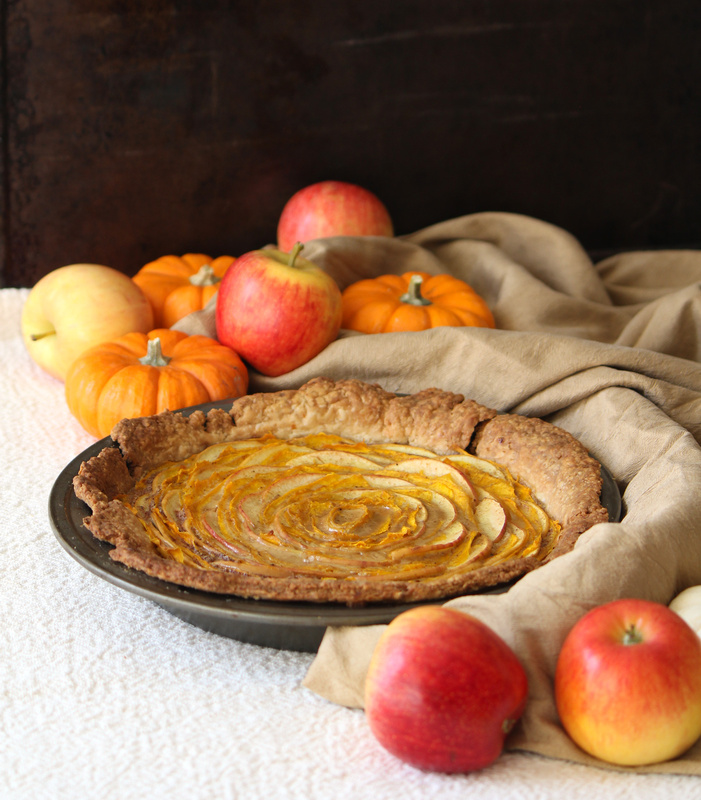 Foodgawker, as pumpkin and apple rose tart.